Six easy and healthy sheet pan meals the whole family will love. Roast chicken, pork, steak, salmon, vegetables, and potatoes all at once! Preparing dinner for a family is no easy task, forget worrying about making something healthy for them. What if you could make an easy and healthy dinner that cooks all at the same time? Oh, and clean up is also a breeze. Would you believe me? You better because that’s what I’m sharing with you today. Five easy and healthy sheet pan meals, plus a sheet pan breakfast. Until recently, I had no idea there was a difference between a sheet pan and what is more commonly used, a jelly pan. Both are similar in size and shape, but a jelly pan is thinner and can’t withstand the high temperatures that sheet pans can; they warp during cooking. Have you ever heard a loud bang when your pan is in the oven? If you answered yes, you have a jelly pan, not a sheet pan. A sheet pan is made of aluminum and can withstand high temperatures. It can be used for anything from baking cookies to roasting vegetables. I purchased this inexpensive sheet pan from Amazon and so far I’m loving everything about it. Another must have when cooking with sheet pans is a silicone baking mat to prevent food from sticking. This is the exact mat I use; it prevents the use of butter, oil, or spray and replaces parchment paper. Have I convinced you yet? If not, try making one of the following dinner ideas and you will be sold! Sheet pan steak fajitas are juicy, tasty, and an easy weeknight meal. Serve with your choice of side like rice and beans or roasted corn and cotija cheese. Fajitas are one of my favorite weeknight meals. They are easy to make and you can add whatever you want to them! To avoid getting bored with the same old same old, change up the protein with options like chicken, shrimp, and even tofu. These sheet pan fajitas used flank steak seasoned in a fajita seasoning from Penzeys Spices. Serve with your favorite side; I made Trader Joe’s Mexican-style roasted corn with cotijas cheese. And by made, I mean heated up and sprinkled cheese on top! Season steak with salt, pepper, and fajitas seasoning. Place in large plastic bag and add olive oil and soy sauce. Let steak marinate at room temperature for 10 minutes. Add baking mat to sheet pan and place peppers and onions around outter edge. Place steak in middle. Cook for 12-15 minutes, then broil for additional 2 mniutes. Use a meat thermometer to check that its cooked to your preference. About 140 for medium rare and 150 for medium. Remove from oven and let rest 10 minutes. Cut steak against the grain. Spread sour cream down center of tortilla, then top with steak, peppers and onions, and cilantro. Add any other favorite toppings! Beef stroganoff is a creamy and delicious dinner the whole family will love! Set it and forgot it – who doesn’t love using a crockpot!? There is nothing better than coming home after work and walking into a house that’s filled with the aroma of tonight’s dinner! This is one of my favorite go to recipes for not only my family, but when we have guests over as well! You can either cook the noodles in a pot on the stove or add them to the crockpot. Just be careful to not overcook the noodles in the crockpot! Add all ingredients except the noodles to a crockpot and cook on low 6-8 hours. Savory steak with grilled summer vegetables like cherry tomatoes, zucchini, squash, and corn drizzled in a balsmic vinaigrette. Summer is hanging on for dear life here in New England; we are still experiencing unseasonably high temperatures. This past weekend it was 90 degrees! I can’t wear my flannel shirts and boots in that weather!! What’s a suburban girl to do?! This recipe reminds me of summer, and I usually make it around the end of August when my garden is still producing produce. But seeing how it still feels like summer, I decided to make it later this year. There are two nice things about this recipe: 1) It can use up lots of fresh garden vegetables! Does anyone else have out of control tomato plants? 2. It’s versatile – don’t have a squash? Fine, use only zucchini. Use any color of bell pepper you have on hand. I’ve also changed up the steak before. Combine 1 tbsp olive oil, garlic, rosemary, thyme, ¼ tsp salt, and ¼ tsp pepper in a baking dish or zip-top bag large enough to hold the steak. Add the steak and marinate for at least 1 hour. Meanwhile, in a small bowl, make the vinaigrette by combining 1 tbsp of the basil, 1 tbsp of the olive oil, vinegar, parsley, and garlic. Season with salt and pepper and set aside. Brush the peppers, squash, zucchini, and corn with 1 tbsp olive oil and season generously with salt and pepper. Grill, turning occasionally, until tender with nice grill marks, 10 to 15 minutes. Arrange all but the corn on a large platter and drizzle half of the vinaigrette on top. Remove the steak from the marinade, season generously with salt and pepper, and grill, flipping once, until grill marks form on both sides and cooked to your liking, about 3 minutes per side for medium rare (135°F). Transfer to a cutting board and let rest for 5 minutes. Cut the corn from the cob and transfer to a medium bowl. Add the tomatoes and the remaining vinaigrette. Season with salt and gently toss. Spoon the corn and tomato mixture over the other vegetables. Slice the steak with the grain into 4- to 5-inch pieces, then slice thinly against the grain and arrange over the vegetables. 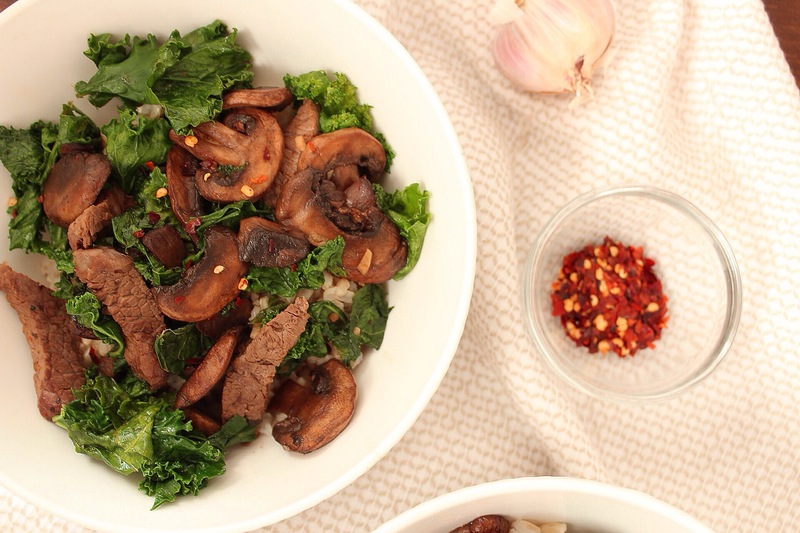 This dinner combines lots of left over ingredients from other dinners this week: steak, kale, and brown rice. The only new ingredient is mushrooms! In medium bowl, mix together soy sauce, Sriracha, 1 tbsp sesame oil, and sherry. Add steak to marinate. Heat 1 tbsp sesame oil in wok over medium heat about 1 minute. Add ginger, garlic, and mushrooms. Cook until mushrooms soften, about 5 minutes. Turn heat to low and add kale, steak/marinade, and honey. Cover and cook until kale has wilted, about 7 minutes. Serve over brown rice. Sprinkle with red pepper flakes for an extra kick! Grilled steak with two easy and healthy side dishes that can be prepped all together to put dinner on the table in 30 minutes. The hubby and I don’t buy steak often, but every time we do I thoroughly enjoy it! Steak and a nice glass of red wine = a happy chef! What’s that saying? Happy wife, happy life?….jk! 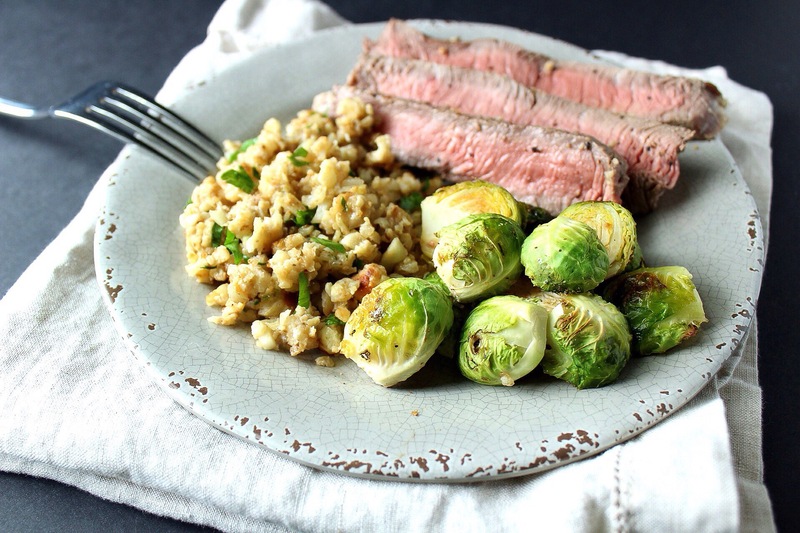 I paired the steak with roasted brussel sprouts and riced parmesan cauliflower! The sides can be prepped ahead of time if needed or everything can be cooked at the same time. The meal comes together in 30 minutes! Place the Brussel sprouts on a large baking sheet, drizzle with olive oil, roasted garlic seasoning, and salt and pepper to taste. Bake for 15 minutes, giving a toss halfway through cooking. While Brussel sprouts are cooking, preheat grill over medium heat. Place on heated grill and cook about five minutes on both sides for medium rare. Let rest 5 minutes, then slice against the grain. While steak is resting heat coconut oil and minced garlic in a wok over medium heat. Cook garlic 1-2 minutes, don’t let it burn. Add cauliflower and cook 5 minutes or until starts browning.